The proposed market report of TMR on the global carotenoids market evaluates the opportunities in the current market, and provides latest updates and key insights corresponding to various segments involved in the global carotenoids market over the forecast period 2018–2027. The report on the global carotenoids market provides historical data of 2013, along with the estimated data for 2018, and forecast data up to 2027 in terms of value (US$ Mn) and volume (MT). In terms of value, the carotenoids market is anticipated to increase at a CAGR of 4.0% during the forecast period. 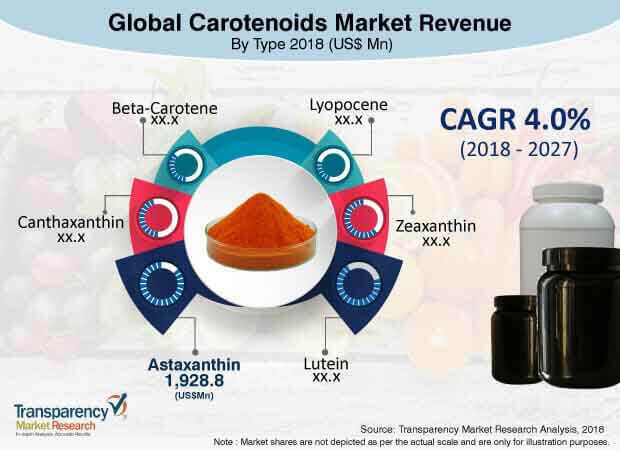 The present study exhibits the trends and market dynamics of the carotenoids market in five major regions - North America, Latin America, Europe, Asia Pacific, and the Middle East and Africa. The report also includes the study of the current issues with consumers and various future opportunities for the carotenoids market. The report explores the global carotenoids market for the period 2018–2027. The primary objective of the global carotenoids market report is to provide insights into key developments in the market that are consistently supporting the transformation of global businesses that are associated with carotenoids. It is very important to consider that, in an ever-wavering economy, we provide the estimated (Y-o-Y) year-on-year growth rate in addition with the Compound Annual Growth Rate (CAGR) for the overall forecast, to understand the better analysis and evaluation of the global carotenoids market, and to discover the equitable opportunities. Yet another key feature of this report is that, the estimation of the global carotenoids market and the corresponding revenue forecast is carried out in terms of absolute dollar opportunity analysis. This is usually not considered with importance while forecasting overall market numbers. Absolute dollar opportunity analysis is very essential in evaluating the degree of opportunity that a provider can observe to execute, as well as to contrast the potential resources from a sales perspective in the global carotenoids market. The global carotenoids market report starts with an elaborated executive summary, the market definition of various segmentations that are included, and their respective shares in the global carotenoids market. The report further incorporates the major macroeconomic factors that have an effect over the growth of the carotenoids market. The market report also highlights various market dynamics, which includes the drivers, restraints, opportunities, and trends in the global carotenoids market. The report further underlines the study of the present issues with industrial processing, and opportunities for the carotenoids market. It also encompasses value chain analysis, which provides a structural view of overall profitability from the manufacturer to the end use of the carotenoids market. In order to provide users with a clear view of the global carotenoids market, we have exhibited a competitive analysis of key market players and their strategic expansions. The competitive dashboard presents a detailed comparison of carotenoid manufacturers on valuable parameters such as key product offerings, total revenue, key developments, and key strategies. The study intensifies the global carotenoids market attractiveness analysis by type, end use, source, and region. To evaluate the overall market size of carotenoids, the report on the carotenoids market considers various fundamental aspects based on secondary research. Furthermore, it emphasizes quantitative evaluation such as market share by type, end use, source, and region, and other qualitative data from primary respondents, which have been consolidated to arrive at clear and accurate market estimations. The forecast provided in the carotenoids market report concludes at the total revenue being generated, and the expected revenue contribution in the future. The detailed profiles of companies are included in the global carotenoids market report to analyze their developmental strategies, key product offerings, and recent developments, as they have a significant role in the global carotenoids market. Major market players covered in the carotenoids market report are Koninklijke DSM N.V., Fuji Chemical Industries Co., Ltd., DDW The Colour House, Vidya Herbs Pvt Ltd, BASF SE, Novus International, Nutralliance, Chr. Hansen Holding A/S, NOW Health Group, Inc., and others.